Oregon Sea Grant has been awarded the APEX 2013 Award of Excellence in the “One-of-a-Kind Education & Training Publications” category for its work on The Oregon Coast Quests Book, 2013-14. 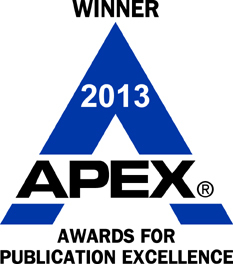 APEX 2013, the 25th Annual Awards for Publication Excellence, is an international competition that recognizes outstanding publications from newsletters and magazines to annual reports, brochures, and websites. According to the APEX 2013 judges, “The awards were based on excellence in graphic design, quality of editorial content, and the success of the entry in conveying the message and achieving overall communications effectiveness.” This year’s competition was “exceptionally intense,” drawing 2,400 entries in 12 major categories. Quests are fun and educational clue-directed hunts that encourage exploration of natural areas. In this self-guided activity, Questers follow a map and find a series of clues to reach a hidden box. 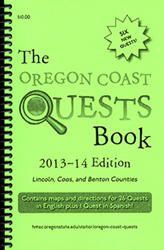 This edition of the Oregon Coast Quests Book contains 26 Quests in three counties (Lincoln, Coos, and Benton), including six brand-new Quests and one in both English and Spanish. The Oregon Coast Quests program is coordinated by Oregon Sea Grant Marine Educator Cait Goodwin, who also oversaw production of the book. Oregon Sea Grant Managing Editor Rick Cooper performed the editing and layout. 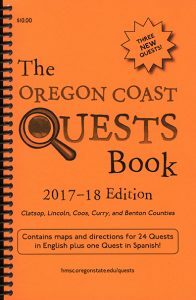 You can order copies of The Oregon Coast Quests Book here. 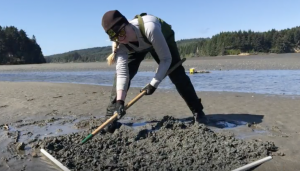 BEND – Oregon Sea Grant’s invasive species specialist, Sam Chan, is the featured speaker for the OSU Cascades Science Pub event on Tuesday, May 21 at McMenamins Old St. Francis School in Bend. The informal event runs from 5:30 to 7:30 p.m and features a full pub menu and no-host bar. Chan, a Sea Grant Extension specialist and biologist with the OSU Institute for Water and Watersheds, will talk about how invasive species arrive in Oregon via land, air and sea, and can cause serious harm to our economy and environment. Learn how these invaders arrive in ways we would never anticipate – through innocent classroom projects, gardening, and on floating tsunami debris – and what you can do to prevent and minimize their impact. Chan’s research guided the creation of the award-winning statewide “Silent Invasion” program. Use this online form to reserve a seat for Hitchhikers from Afar: Aquatic Invasive Species & You. Science Pubs are free but due to their popularity, reservations are required no later than 5:00 p.m. the day prior to each lecture. 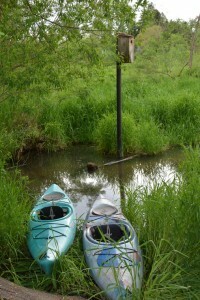 Welcome the newest member of the Oregon Sea Grant blogging family, WISE, the Watershed & Invasive Species Education blog. Amy Schneider, a graduate student and science writer at the University of Oregon, is working with WISE program coordinator Tania Siemens to develop up-to-date, high-value content to help teachers learn about emerging watershed issues, which they can then use to engage their students in science learning and community action. 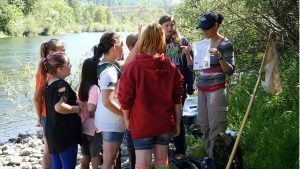 The blog is just the latest teacher tool to emerge from the WISE program, which enlists teachers across Oregon in teacher trainings, a STEM-based curriculum, and on-going engagement in a community for learning and teaching about emerging watershed issues. 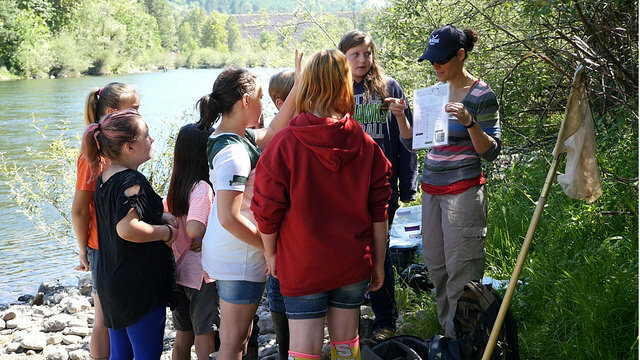 Since the program started in 2007, more than 70 teachers have gone through WISE training, reaching more than 4,500 students who have completed at least 50 watershed stewardship projects. Oregon Sea Grant is soliciting research proposals for one-year grants on two topics of high priority to Oregon’s ocean and coast: Water contaminants, and tsunami-related marine debris. The submission deadline is 5 pm Nov. 5, 2012. 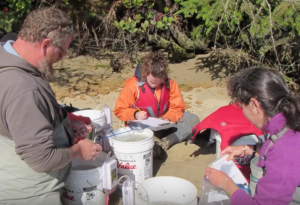 Sea Grant and its citizen advisory council have identified contaminants in Oregon waters – both ocean and freshwater – as an important research issue for the state. The recent and anticipated arrival of marine debris from the March 2011 Japanese tsunami also raises timely research and public engagement questions. As a result, Sea Grant has set aside funding for between one and four single-year grant proposals addressing either of these issues. The total available funding is $80,000. This special funding call seeks proposals that apply the best science and an innovative approach to address either: 1) a well-defined coastal or watershed research question addressing contaminants, or 2) research related to tsunami marine debris. All Oregon Sea Grant research grants must include public outreach and engagement components.